You never forget your first time. . . The intimate escalation of tension. The subtle signs of arousal. Rhythmic heart beats increasing in percussion with each slide of hand, parting of lips and shedding of clothing. . . And then there are the ominous cockroaches scuttling about. The warbling croak that emanates from her throat and steadily lifts in pitch. The goblet of sacrificial, congealed blood that spills all over you as you panic with your pants down. What a moment of sexual discovery that stays lodged with you forever. . . Taking course over a single day, NIGHT OF THE VIRGIN (LA NOCHE DEL VIRGEN) follows the attempted sexual exploits of Nico (Javier Bodalo), a rat-faced loser with zero game, but max desperation. During a New Year’s Eve party, the maladroit buffoon happens to meet an older woman named Medea (Miriam Martin) who seduces the hopeful young man and lures him back to her apartment for some potential horizontal bopping. Unfortunately for Nico, this particular nightfall will bring about a series of events both horrific and comedic, as well as a deflowering he’ll soon regret. 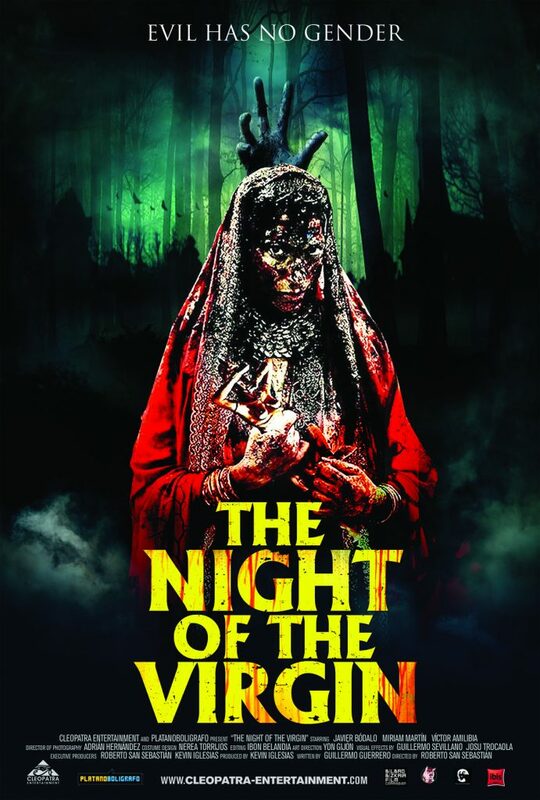 As the current trend for movie trailers seems to be that of depicting the entire film in chronological order while also revealing spoilers (seriously, avoid the recent previews for THE PREDATOR and BAD TIMES AT THE EL ROYALE), I managed to avoid viewing any teaser for NIGHT OF THE VIRGIN prior to watching it in full. Due to this, I was admittedly surprised by the tonal shifts, clever writing and consistent misdirection that NOTV contained. What starts like any number of horror movies gradually shifts into that of an awkward comedy before becoming that of a portend-heavy thriller. As NOTV progresses, it continues to switch gears, genres and adds on the chuckles just as frequently as it does the disquieting content. For a large deal, I didn’t really know where the story was truly going to go; what path it was actually going to tread. However, as compelling as such a non-defined structure is, it also results in tedium. Certain portions contain too much back-and-forth between the triage of actors that it borders on slapstick. The script becomes so obsessed with its own initial creativity that it seemingly forgets to progress the story and vainly sticks to monotonous comedic shticks to pad out the runtime. I was initially enjoying myself until the constant misdirection became dull and I simply wanted the narrative to just progress the original conflict. Thankfully, once the story crosses into the threshold of its third act, the cinematic condom is removed and NOTV plays it utterly unsafe. The finale is such a spectacle of shock, bodily fluids and outlandishness that it calls to mind early Peter Jackson or Frank Henenlotter. It’s funny, entertaining and a repulsively rewarding payoff to the previous slow burn. NOTV’s horrific ridiculousness is made oddly believable by the two actors involved in the ever-escalating shenanigans. While a third subject enters the movie in the last half, the majority of screen time is spent in a single location (an apartment) with seductress and virgin engaging in odd banter, sexual activities and aberrant behavior. Neither Medea nor Nico are the normal ideal of beauty and have strange physical characteristics (especially Nico’s saucer-eyes) that make them all the more intriguing to watch. As Nico isn’t a hunk, Medea not a goddess, their battle of the sexes feels more grounded than had these characters been written as visually stunning heartthrobs. I know that might come off as insensitive, but such a purposeful choice in casting benefits the bizarre nature of NOTV and makes such subjects all the more memorable. So yeah, take it as a compliment. NIGHT OF THE VIRGIN is a peculiar but commendable effort that’s both ambitious in its vulgarity and knowledgeable in the genres it skewers. For those that enjoy their foreign fare subversive and unapologetically repugnant, Roberto San Sebastien’s directorial debut will surely have you feeling just as violated as its central protagonist.